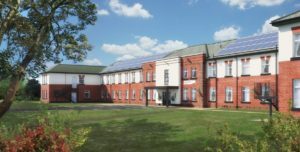 Exemplar Health Care’s Brook View nursing home will officially open this spring, with work underway to prepare for residents’ arrival at the transformed 32-room service that sits on the same site as Aintree University Hospital. The specialist adult home in the suburb of Fazakerley is looking for medical professionals and domestic staff to join its team ahead of the grand opening in June. Senior Director of Operations at Exemplar, Selina Wall, told JMU Journalism: “This is a fantastic opportunity to be part of our new home in Fazakerley and for a new team to play a role in making Brook View their own, particularly for medical professionals wanting to move away from hospital life to a more holistic care environment. A spokesperson said: “Brook View will need everything from neurological nurses to carers and cooks, so people from the local area are encouraged to get in touch if they are interested in any types of roles. The facility will be Exemplar’s second Liverpool home, alongside Kavanagh Place, which has been in the city for 10 years. It is rated good in all areas by the Care Quality Commission and specialises in care for people with complex needs. The organisation are inviting local health and social care professionals down to a pre-completion preview event of the newest specialist care home on March 20th, where they will give an exclusive tour of the facilities and grounds. For more information on the roles available at Brook View, click here.